In a sixty acre gated neighborhood park with many large picnic shelters and playground areas. This course is moderately wooded with some hills and nice variety. From downtown Columbia; W 7th St. for 0.6 mile to a slight left onto Mt Pleasant Pike/Trotwood Ave. Go 0.3 mile to a left on Woldridge Dr. to the Woodland Park entrance on the right in 0.2 mile. Park in first lot on the right. 1st tee is across the street, just north of that parking lot. One of the best courses around. Great mix if trees, elevation, and length. The par setting are too generous, but it's a well built, very clean course with some seriously long and crazy short holes mixed together. 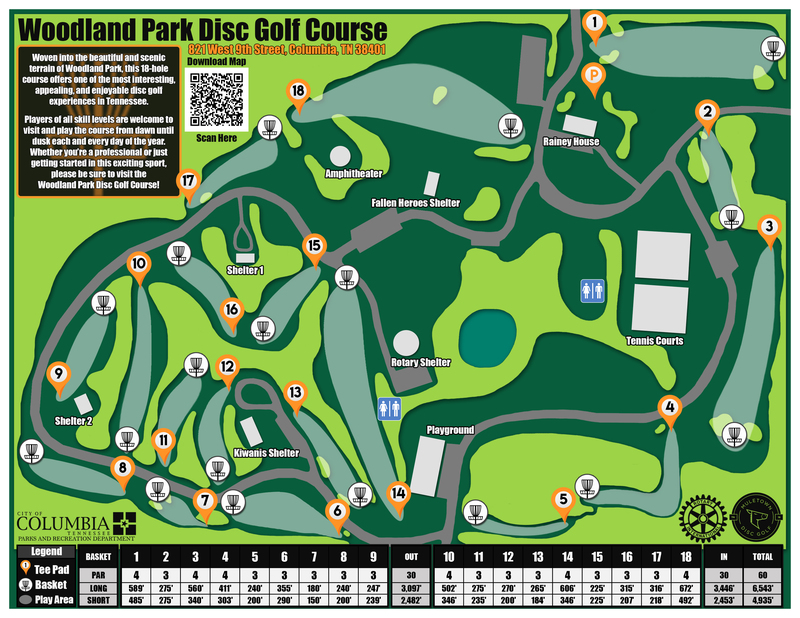 NEVER crowded, so if you like to have the course to yourself, here's your place!